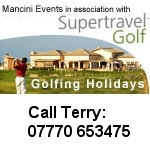 Mancini Events are experts in the field of Corporate Golfing Events and Corporate Incentive Travel. For more than 20 years we have managed corporate events, organising corporate incentive travel, corporate golfing events & corporate product launches around the world. Cape Town, Mauritius, Barbados, LA, & Dubai are some of the locations we have previously worked with and closer to home, Spain, Portugal, Ireland & London have also proved to be popular. We have been formed to include a corporate event management team with experience; organisation & negotiating skills, which will all be used to work with you on your event brief, helping you, choose the perfect venue for your corporate event. We will then endeavour to make your event as seamless as possible working with a designated event manager throughout your project. The nature of this corporate trip was a sales incentive for the top 20 sales staff to be rewarded with a 3 night trip to Los Angeles over the May bank holiday. A number of flight seats were booked with Virgin Atlantic in economy, premium economy & business class with a selection of single, twin & sea view rooms at Shutters Hotel in Santa Monica. Private cabanas around the pool were arranged for the group to use each day. Our corporate event management team worked with a ground agent who was based in Los Angeles & through them all the transfers, activities, restaurants & clubs were arranged. On arrival in Los Angeles the group were met & taken to Shutters Hotel where they checked in & had an evening meal, they were then taken to The Bungalow at Fairmont where they had VIP access. The 2nd morning was spent at leisure with a 2hr segway tour booked in the afternoon finishing with drinks at a bar on Santa Monica Pier. Dinner was booked on the beach at Gladstones and the evening ended at the Cameo Club. Beach volleyball & frisbee were offered for the 3rd morning with an optional tour of Hollywood in the afternoon culminating with drinks at Traders Vic in the Beverley Hills Hilton before returning to the hotel to change. A late dinner was booked at the Penthouse Restaurant with roof top lounge and private cabanas were reserved for the evening. The final day was more relaxed with a late check out in a couple of rooms and a meal at the hotel's beach restaurant before transferring to the airport for the overnight flight back to London. We have experience in arranging corporate group travel and incentive trips and appreciate that there are often late changes to the itinerary. We always work closely with the corporate client to ensure all their expectations are met.